WHAT I SMELL: Thirty Three opens with a deep rose and oud in that plasticine way that sometimes oud can project. It’s exotic, smooth, lush and it’s tinged with hints of spice. After a couple of minutes a bit of leather is added giving it a rather burnished finish, like a saddle that has been rubbed with some expensive oils to keep it soft and subtle. But just as soon as I think this is turning leathery, those aspects fade away. Interesting, the fragrance has a wonderful way of bouncing off my skin. One minute I think it’s retreating and soon afterwards it seems to project significantly off my skin. 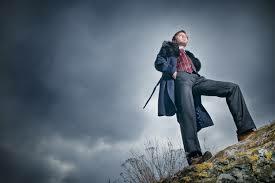 I just put a couple of drops on my wrist and trust me, those couple of drops are going a long way. After around the 30 minute mark, Thirty Three begins to soften and dry out and after around an hour, it becomes almost smoky. In the end, Thirty Three is pretty linear, but that’s fine as it’s big, bold, yet thankfully rather handsome too; and there’s nothing wrong with that. BOTTOM LINE: To me, Thirty Three isn’t an office scent as it could easily overpower if you weren’t careful with your application. But if you’re looking for something that makes a bold statement without beating up others with that statement, this might be a great choice. 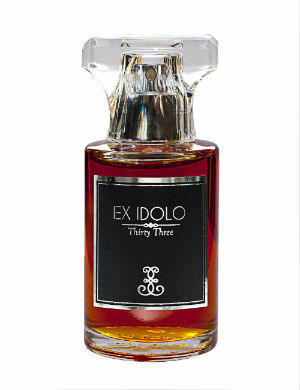 Categories: Ex Idolo | Tags: 3 bones, EDP, Ex Idolo, fragrance, Oriental Woody, Perfume, review, Thirty Three | Permalink. It is hard to find perfumes with this deep hue nowdays. And it is very nice that it is not overwhelming or too tangy as oud can be. Albeit not a wild ride. It’s a nice one. It’s on my “to try” list and it was suggested that I would like it. Your 3.5 bones suggest it as well (I would have worried if you loved it since our tastes are different). We’ll see. Hmmmmm, I see this as a “like” and not a “love” for you. Let me know what you think when you try it.